When a friend directed me to the shipping container behind a house where she had lived on 5th Street, I knew that I had a posting. It is a thin one, but the quirk of shipping containers and the degree of difficulty involved (most,you would think, would be out of sight behind a house) added up to proceeding. This is the calculation used to determine the TQR (total quirk rating). 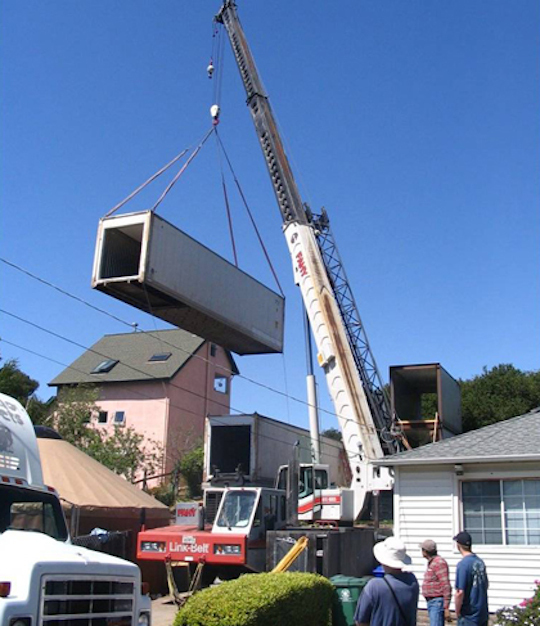 We are easily there with shipping containers. 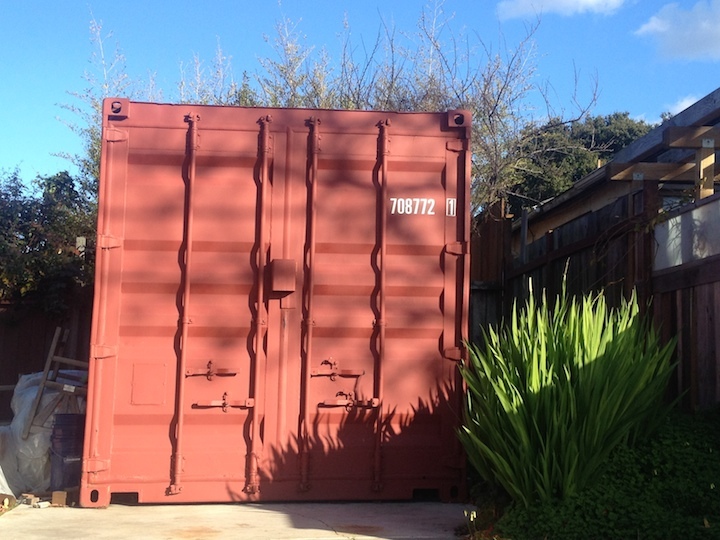 This is the first shipping container I saw on a residential lot. Stark. If it were a one-off, I’d have to pass. But it isn’t. 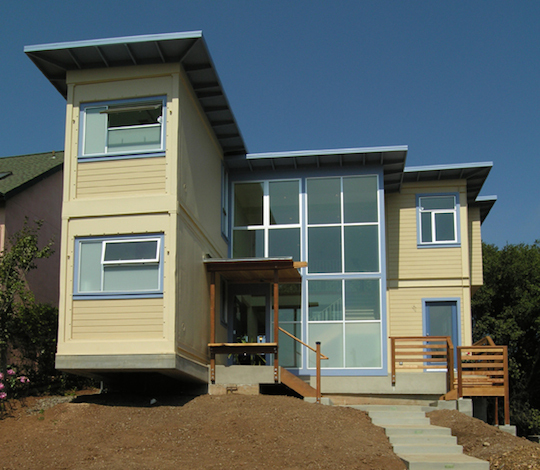 Karl Wanaselja and Cate Leger are two most inspiring architects who are hell-bent on re-using. This ethos is front and center in the building at the northwest corner Martin Luther King Jr. Way and Dwight Way. 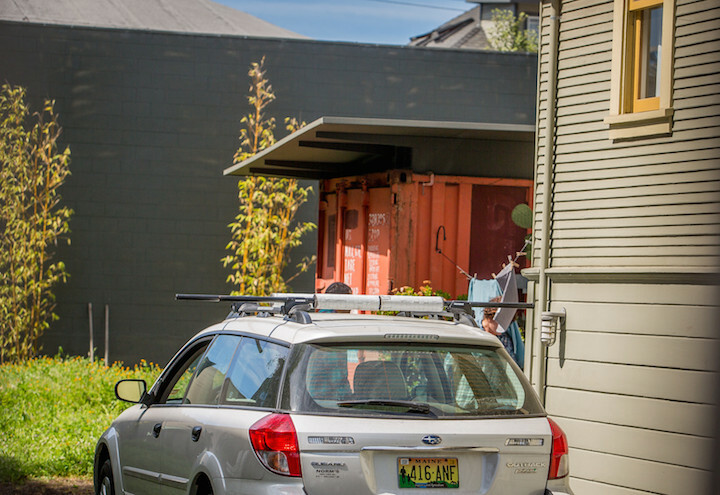 You know it – street signs repurposed, a gate made from Volvo lift backs, automobile sunroofs as awnings. They live a few blocks from Dwight and King, on McGee, in a house that is another testimonial to re-using. Behind the house they have two shipping containers – or more likely two halves of a shipping container – configured in an L shape, serving as their offices. Pretty danged cool. They have designed an entire house with shipping containers. Which brings us to Fifth Street. This Google Map satellite photo shows where the shipping container in question is – under a roof behind the house. It is slightly visible from the street. It counts! Well,that’s four. Five if you count Karl and Cate’s as two. And I’m counting the entire house because I haven’t figured out where it is. 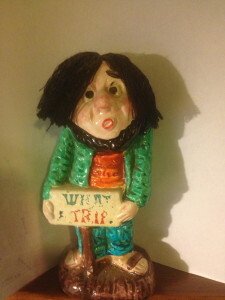 I will now reach for the break-the-rules lever and, yes, break the rules. 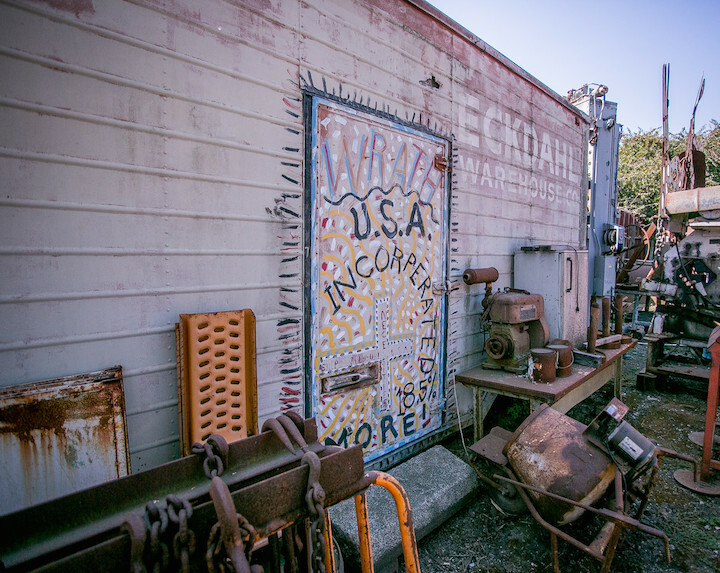 Let’s tiptoe into Oakland, take a photo and come back. 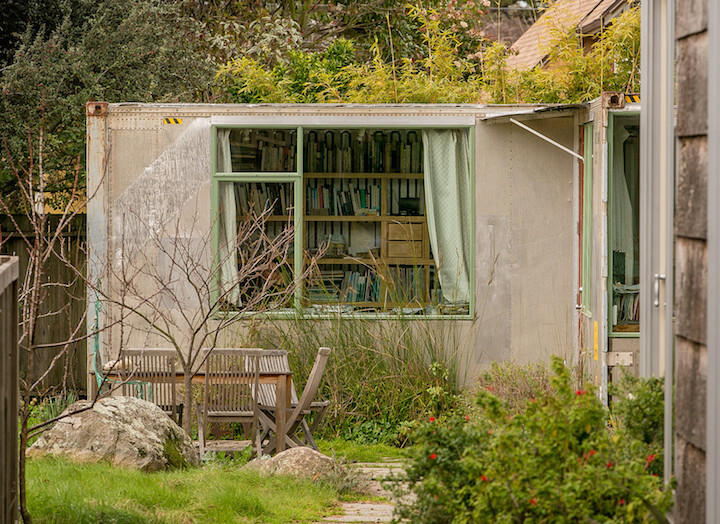 This is a shipping container at Mark Bulwinkle’s Oakland compound. He lived in here for a while as he went through a divorce. It is rumored that this is where he was living when he told Oprah Winfrey’s staff that he was not interested in appearing on her show. I showed these photos to my friend. He was gathering photos about the Magic Gardens in South Philadelphia, fascinated and caught up in the fun of it. I promised him that we could make an off-topic posting about Magic Gardens next, and with that he took a look at the photos of the shipping containers. He was amused, chuckling at the thought of Bulwinkle saying no to Oprah. 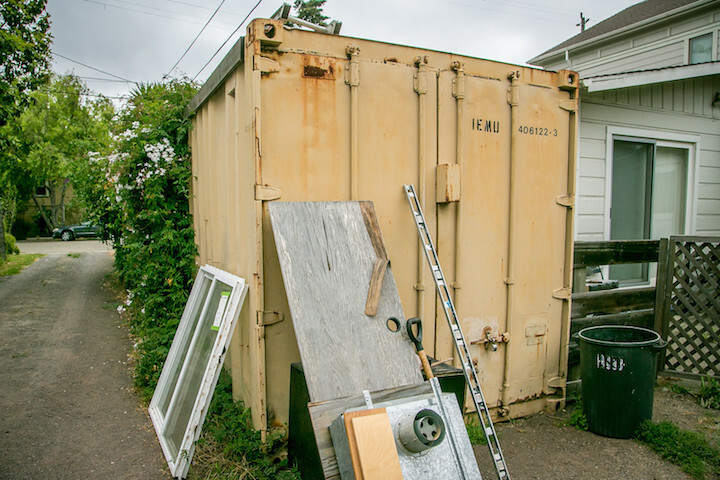 What about the idea of containers in yards?